What if I could change a life by helping someone’s skin? Have you ever spent time in front of a mirror looking at your skin- your freckles or your wrinkles or the pattern of your pores? Have you heard yourself think or say, “Wow, they have gorgeous skin!” Most likely you have found yourself studying facial products at the store, sitting in front of an aesthetician getting a facial, or maybe even contemplating going to school to be a Skin Care Specialist. The good news? The outlook for skin care specialist jobs is very positive and on the ups! According to the Occupational Outlook Handbook, which is supplied information based on careful statistical data by the United States Department of Labor, projects that jobs forskin care specialists will only rise between now and the year 2024. In fact, their website says that the change in employment over the next ten years is accelerating at a “faster than average” rate of 12%, where as the average growth rate for all other occupations is 7%. To put it in another perspective, think about women. In 2010, the US population was 308 million, of which 50.8% were women.1 Nearly one-quarter of these 157 million females were under 18, which means that the remaining group of women were 18 years of age and older. To be honest, at 18 years old, I was not worried about skin cancer or wrinkles. Yet at age 30, I had sworn off the sun, wore SPF 15 every single day, and embraced my un-tanned skin. I remember saying to my grandmother, “I don’t care about wrinkles! Aging women are beautiful! I don’t know why you worry so much about wrinkles!” And guess what I do now in the car when the sun is shining on my face? The point is, over half of the female population in this country are over 35 years old and we ALL pull our skin away from our eyes or dab on under-eye cream at night or think to ourselves, “I’m getting so old.” Granted, not every person is proactive, but here in AZ? We’re taking care of our skin and for those of you who didn’t have a grandma who had melanoma, and shouted at you daily, “Put on sunscreen!”, people need help taking care of their skin! That’s where you come into play. If you’re reading this blog, maybe you have been toying with the idea to go to school to be an aesthetician, or in the least, are here looking into it. 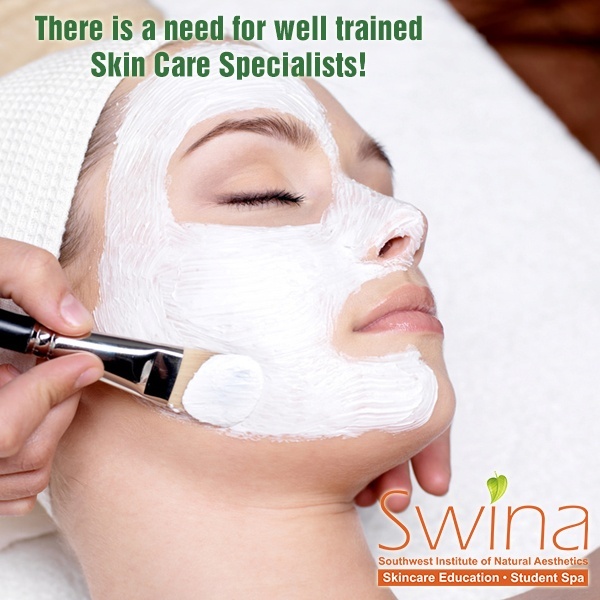 Whether this is your first time to our SWINA site or twentieth; or if you’re obsessed with skin and just happened to find this page: something is drawing you in. Here in AZ, the natural elements are working hard against us! Between the bone-dry climate, the dust and the wind, the potent sun and the swimming pools, our skin takes quite a beating, even if you use great beauty products, take your makeup off every night, and drink 100 ounces of water a day. Problematic skin is something many people battle and it can become disheartening, embarrassing, and sometimes downright depressing. When you see a person’s reaction to healthy skin they’ve never had, you will experience a rewarding sensation that many never experience through their work! There is no greater reward than helping someone love their ‘self’ more, and being there to witness it. Earning your credentials that will help people find their way to beautiful skin will not only change their lives, but yours too! Just think…. Imagine if your next career changed your entire life! 1 This fact from the HRSA( US Department of Health and Human Services). This is the primary Federal agency for improving health.